As a result of World War II, Germany had been split into the Federal Republic of Germany (FRG - Bundesrepublik Deutschland, hereafter referred to as West Germany) and the German Democratic Republic (GDR - Deutsche Demokratische Republik, known as East Germany). In October 1990, the GDR joined West Germany. Germany is a federal republic divided into 16 states or Länder. The German bicameral parliament consists of the Bundestag (federal assembly) and the Bundesrat (federal council). The members of the Bundestag are elected by popular vote based on proportional representation. The members of the Bundesrat are representatives of the governments of the 16 states (Landesregierungen). Therefore the composition of the Bundesrat can change whenever one of the 16 Länder holds an election. Bundestag and Bundesrat are both involved in legislation. The Federal President is elected by the Federal Assembly consisting of the Bundestag and representatives chosen by the state parliaments. The Bundestag decides who is to be the head of the Federal Government, i.e. the Federal Chancellor. The Chancellor has the right to form the Federal Cabinet, but he/she needs the confirmation of the Federal President for the appointment of the ministers. The Chancellor, together with the Federal Ministers, is responsible for the conduct of Federal Government business. The Federal Republic of Germany is situated in central Europe and has nine neighbouring countries, Denmark, Poland, the Czech Republic, Austria, Switzerland, France, Luxembourg, Belgium and the Netherlands, and borders to the North Sea and the Baltic Sea. Germany has a temperate climate with an average annual temperature of +9°C. The average annual precipitation is 700 mm. Currently the population of Germany decreases from a peak of 82.5 million inhabitants in 2002. According to estimations of the Federal Statistical Office (Statistisches Bundesamt), this trend will hold on due to steadily decreasing birth rates. It is expected that in the year 2060 the population will be about 65 to 70 millions. 1) Numbers in brackets refer to data from the former GDR. Source: Country Information  and IMF-International Monetary Fund. Source: Country Information  and World Energy Council. 7) preliminary data Source: Country Information  . The energy policy is, within the Federal Government, the responsibility of the Federal Ministry of Economics and Technology (Bundesministerium für Wirtschaft und Technologie - BMWi). Market adoption of renewable energy sources and research on renewables is overseen by the Federal Ministry for the Environment, Nature Conservation and Nuclear Safety (Bundesministerium für Umwelt, Naturschutz und Reaktorsicherheit - BMU). The major aims of energy policy are energy security, economic efficiency and environmental sustainability. As Germany is poor in natural raw materials, the country is particularly reliant on imports. To secure the supplies the use of a broad mix of energy suppliers and of different sources from around the world is favoured. In addition, it is intended to reduce energy needs by a more economical and rational use. In 2001, the Federal Government and the energy utilities agreed to phase-out nuclear energy use for commercial power generation and the Atomic Energy Act was amended accordingly in 2002. Each nuclear power plant was assigned a residual electricity output such that total output corresponds to an average 32-year lifetime. As output allowances can be legally transferred between power stations, it is not possible to forecast precise shut-down dates. Additionally, a legal ban on the construction of new nuclear power plants was fixed. In September 2009, general Federal elections took place. The newly elected government consists of a coalition between three parties, i.e. the Christian Democratic Parties (CDU and CSU) and the Liberal Democratic Party (FDP). The Government adopted its energy concept. Step by step, until 2050 60% of the power supply and even 80% of electricity should be generated by renewables. To reach this aim, from 2011 the Government will make available additional funds in the framework of the energy concept that will increase to up to 2.5 billion Euros in the medium term and will be used for renewables energies, energy efficiency, research in these fields, national climate protection and other fields of action in the energy concept. In addition, the operating lives of the 17 nuclear power plants, determined by the amount of electricity allowed for production, are extended by granting further electricity production rights grossly equalling additional 12 years on average. The seven nuclear power plants commissioned up to and including 1980 are granted 8 years. For plants commissioned after 1980 there is an extension of 14 years. The extension is converted into volumes of electricity for each plant on the basis of exact calculation. The extension of operating lives as a bridge also creates the opportunity to increase financing in the fields of renewable energies and energy efficiency. To this end - in addition to the tax on nuclear fuel - a contractual agreement is concluded with the operators of Germany's nuclear power plants on absorbing half of the additional profits resulting from the extended operating lives. The operators will make payments of up to 300 million Euros annually in the years 2011 and 2012, and of up to 200 million Euros annually in the years 2013 to 2016. Once the nuclear fuel tax expires from 2017, the payment obligations will result from the additional volumes of electricity from the extended operating lives. German electricity policy is based on three fundamental objectives: sustainability, security of supply and economic efficiency. The main challenge will be the integration of an increasing number of plants generating electricity from renewable sources, including a large amount of offshore wind farms in the Baltic and North Sea. As a consequence, the German electricity grid and the electricity market are facing fundamental alterations. Since 1998 Germany is continuing the process of liberalising its electricity market. Currently all customers are free to choose their own suppliers. The Energy Industry Act (Energiewirtschaftsgesetz) together with secondary legislation enacted under it specifies a new regulatory framework governing grid access and transmission fees for electricity and gas. The objective is to provide the public with a secure, affordable, consumer-friendly, efficient and environmentally compatible supply of grid electricity and gas. Enforcement lies with the Federal Network Agency (Bundesnetzagentur), which regulates electricity, gas, telecommunications, postal and railway networks spanning two or more federal states and network operators with more than 100,000 customers. Network operators with fewer than 100,000 customers are regulated by regulatory agencies in the individual German federal states. The main features of the new legal framework relate to network access and transit fees, and separating network operation from companies' other activities. The network regulator, a public agency under the Federal Ministry of Economics and Technology, has a clear legal mandate to keep down transit fees, while assuring security of supply. Network operators are required to operate a secure, reliable, high-capacity energy supply network, to maintain this network and to expand it in line with demand. Four large companies dominate electricity generation in Germany (E.ON, RWE, EnBW and Vattenfall). Combined, these companies generated more than 85% of electricity in Germany in the year 2005; the remainder came from independent generators, industry self-generators selling back to the grid and industry producing for its own use. Though demand for electricity is forecast to remain relatively flat, construction projects for power plants using both conventional fuels and renewables are currently in the planning, preparation or building phase in order to replace existing plants, particularly nuclear plants as being slated for closure. Germany's transmission grid is well interconnected and made of about 36,000 km of extra-high-voltage (220 to 380 kilovolt), 75,200 km of high-voltage (> 60 to < 220 kilovolt), 493,000 km of medium-voltage (6 to 60 kilovolt) and 1,067,100 km of low-voltage (0.4 kilovolt) transmission lines. In the past the four companies dominating electricity generation each owned their own transmission companies operating the extra-high-voltage transmission lines. Now, the transmission companies are legally unbundled companies (transpower stromübertragungs GMbH, Amprion GmbH, EnBW Transportnetze AG and 50-Hertz-Transmission GmbH). They must provide non-discriminating third-party access to their networks for all generators. All decisions on grid access and access fees can be appealed to the Federal Network Agency (Bundesnetzagentur) or the respective regional regulator (Länderregulierungsbehörde). Grid fees, which cover transmission operations and investments, are charged to distributors companies, which pass them on the end-use customers via retail rates. Transmission system operators charge distribution companies via a "postage stamp" rate, at a single flat rate per kW of maximum demand. Under the Renewable Energy Sources Act, grid system operators are required to connect plants generating electricity from renewable sources to their system at standard rates and to guarantee priority feed-in and transmission of electricity by such plants. The extension of renewables, an intensified transboundary power trading and new conventional power plants are the main reasons for the plans to build up new extra-high-voltage transmission lines. Germany's network is linked to its neighbours' power grids via cross-border connections. The interconnection capacity is equivalent to about 15% of total capacity. The transmission lines for lower voltages are used to distribute electricity to the customers. In this part various regional and municipal transmission companies are involved. There are over 400 distribution network operators in Germany. There is significant cross-ownership of distribution and retail in Germany's electricity sector through the country's many regional and local utilities, or Stadtwerke. The electricity generating companies, E.ON, RWE, EnBW and Vattenfall, have stakes in a large percentage of Stadtwerke, but the Bundeskartellamt has become more and more restrictive in its approval of such mergers. The capacity of electrical plants and the electricity production as shown in Table 5 are reported as gross values. Hard coal, lignite and nuclear power plants typically run with a maximum number of operating hours. They provide 65% of the total electricity consumption as base load. Gas power and pump-storage facilities are used additionally during peak load times. For further information regarding the electricity system see . 4) preliminary data Source: Country Information   and BDEW-Bund der Energie- und Wasserwirtschaft. 2) Net import / Total energy consumption Source: Country Information. In 1955, West Germany officially renounced to produce, possess or use nuclear weapons and research and development of nuclear energy for peaceful purposes began. Based on extensive international co-operation several prototype reactors were constructed and concepts for a closed nuclear fuel cycle and for the final storage of radioactive waste in deep geological formations were elaborated. From 1956 to 1969 several nuclear research centres were founded in West Germany. Most of these research centres as well as university institutes were equipped with research reactors. With the assistance of US manufacturers, Germany started to develop commercial nuclear power plants (Siemens/Westinghouse for pressurized water reactors - PWR, General Electric/AEG for boiling water reactors - BWR). In 1958, the first German nuclear power plant (NPP) - a 16 MWe experimental nuclear power plant (Versuchsatomkraftwerk Kahl, VAK) - was ordered from General Electric/AEG and reached criticality in 1960. The domestic German nuclear development began in 1961 with the order of the 15 MWe pebble-bed high-temperature reactor (Arbeitsgemeinschaft Versuchsreaktor at Jülich, AVR) from BBK/BBC. Power reactors with 250-350 MWe and 600-700 MWe were ordered between 1965 and 1970. After about 15 years, the gap between the German and the international technological state of the art was closed. The German nuclear industry received the first orders from abroad, from the Netherlands (Borssele) and from Argentina (Atucha). In 1972, the construction of the world’s then largest reactor, Biblis A with 1200 MWe, started in Germany. Between 1970 and 1975, on the average three units were ordered annually. In 1969, Siemens and AEG founded Kraftwerk Union (KWU) by merging their respective nuclear activities. The domestic development of KWU nuclear power plants with PWRs started. Based on several years of operational experience, a standardized 1300 MWe PWR (the so-called "Konvoi") was introduced, mainly to speed up the licensing process. Three "Konvoi"-units started to operate in 1988 and were the last NPPs built in Germany. East Germany started to develop a nuclear programme for the peaceful use of nuclear energy with the assistance of the Soviet Union in 1955. In 1956, the Central Institute for Nuclear Physics was founded at Rossendorf. There, in 1957, a research reactor supplied by the Soviet Union started operation. The first East German 70 MWe nuclear power plant Rheinsberg, equipped with a Russian type PWR, was connected to the grid in 1966. Between 1974 and 1979, the Greifswald NPP units 1 to 4 started operation, all equipped with Russian WWER-440/W-230 reactors. In 1989, unit 5, a WWER-440/W-213 reactor, was in the process of commissioning. Following the German unification, comprehensive safety assessments of the Soviet type NPPs were carried out. These analyses showed safety deficiencies in comparison with the current West German nuclear safety requirements. Due to technical and economic reasons - in particular uncertainties in the licensing process and also decreasing electricity consumption - it was decided to shut down these plants. Also, work on the nuclear plants under construction (units 6, 7 and 8 at Greifswald with WWER-440/W-213 reactors and two WWER-1000 reactors near Stendal) was abandoned. Following the euphoria in the fifties and sixties, scepticism about nuclear power began to grow in the early 1970s. Increasing number of citizens opposed to the risks of atomic energy, and in particular to the further expansion of nuclear power plants. Names such as Wyhl and Brokdorf (planned nuclear power plants), Gorleben (waste management centre), Wackersdorf (reprocessing unit) and Kalkar (fast breeder) are a synonym for the protests against nuclear power. After the incident in Harrisburg in 1979 and finally after the disaster of Chernobyl in 1986, it became clear that the risks of nuclear power are not merely theoretical. In 2000, the Government concluded an agreement with the electricity companies to phase out the utilisation of nuclear energy in a structured manner. The Atomic Energy Act was accordingly amended on 26 April 2002. Since 2009 the Federal Government focuses on an energy mix with gradually replacing the conventional sources of energy by renewable energies. For a transitional period, nuclear energy will remain an indispensable part of the energy mix While the legal ban on the construction of new nuclear power plants remains unchanged, the operating lives of the German nuclear power plants are extended in compliance with the rigorous German and international safety standards and to use a substantial part of the additional profits of the power plant operators to accelerate the way into the age of regenerative energy, for example through increased research on energy efficiency and on the storage technologies (see chapter 1.2.3). For organisations of the regulatory body please refer to chapter 3.1.1. 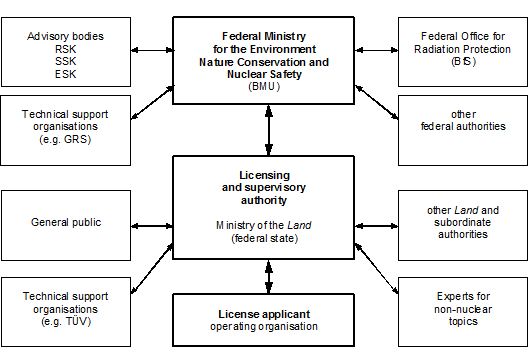 The interaction of the different authorities and organizations involved in the nuclear licensing and supervision procedure is shown in Figure 1. The licensing procedure and the continuous regulatory supervision of the facilities lie within the responsibility of the individual Länder (federal states), see Table 7. To preserve legal uniformity for the entire territory of the Federal Republic of Germany, the Federal Ministry for the Environment, Nature Conservation and Nuclear Safety (Bundesministerium für Umwelt, Naturschutz und Reaktorsicherheit - BMU) supervises the licensing and supervisory activities of the Länder authorities regarding lawfulness and expediency. . The subordinate authority to the BMU in the area of radiation protection and nuclear safety is the Federal Office for Radiation Protection (Bundesamt für Strahlenschutz – BfS). The BfS supports the BMU technically and scientifically, especially in the execution of oversight with regard to legality and expediency, the preparation of legal and administrative procedures, and in intergovernmental co-operation. The BMU receives regular advisory support from the Reactor Safety Commission (Reaktor-Sicherheitskommission - RSK), the Commission on Radiological Protection (Strahlenschutzkommission - SSK) and the Nuclear Waste Management Commission (Entsorgungskommission - ESK). The commissions are independent and their members reflect the whole spectrum of scientific and technical opinions. Besides advising the BMU on issues of fundamental importance, they also initiate developments directed at furthering safety technology. The main expert organisation advising the BMU on technical issues is the Gesellschaft für Anlagen- und Reaktorsicherheit (GRS). This central expert organisation performs scientific research in the field of nuclear safety technology, predominately sponsored by federal funds. The involvement of authorized experts is based on special technical knowledge and independency. In this area the Technical inspection Agencies (Technischer Überwachungs-Verein - TÜV) act on behalf of the Länder authority. The Länder authorities are not bound by the authorised experts’ evaluation results in making their decision. In 2009, a total gross capacity of 21.5 GWe was installed in the 17 operating German nuclear power plants, comprising 11 pressurized water reactors (PWR) and 6 boiling water reactors (BWR). Table 8 shows the status of nuclear power plants by the end of 2009, Figure 2 the geographical location. According to the Atomic Energy Act the right for operation will expire after the production of a certain electricity volume fixed individually for each NPP. As output allowances can be legally transferred between power stations, it is not possible to forecast precise shut-down dates. Table 9 shows the residual electricity volumes of the German NPPs as of 31 December 2009. The current Government adjusted this phase-out strategy and extended lifetimes of nuclear power plants (see chapter 1.2.3). In 2009 (2008), nuclear power plants contributed approximately 22.6% (23.3%) to the gross electricity production, which corresponds to 134.9 (148.8) TWh. The average availability of German nuclear power plants is shown in Table 10. Until December 2009, 19 nuclear power plants were permanently shut down. From these, 15 facilities are currently being dismantled with "green-field conditions" being the planned target, two are in safe enclosure and two have already been completely dismantled to green-field conditions. Six other nuclear power plants did never start operation since the projects were abandoned during the construction phase. Further information (shut down date and reason etc.) is shown in Table 11. 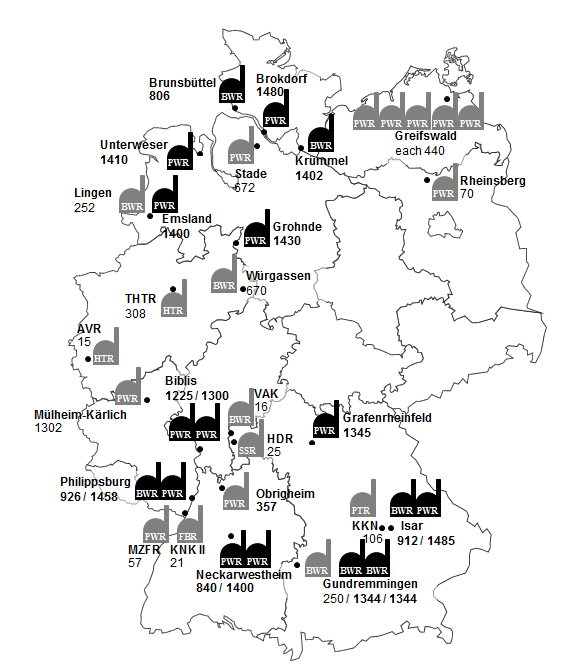 In total, 46 research reactors were built and operated in Germany. At present most research reactors are shut down and being decommissioned. Ten research facilities – four with a capacity of more than 50 kW thermal power and six small training reactors – are still in operation. Source: Country information year-end 2009 .
or a volume of up to 21.45 TWh may be transferred to KWB-B. 2) The NPP Obrigheim was shut down in May 2005. 3) The NPP Stade was shut down in November 2003. Planned modifications of a nuclear power plant are to be assessed systematically with regards to the impacts on the safety level of the nuclear power plant. Modifications having obviously only insignificant impacts on the safety level do not require a licensing procedure but require accompanying inspections by the safety authorities within the framework of the supervisory procedure. Significant modifications of a nuclear power plants or its operation require a licence by the competent authority (see chapter 3.2). All operators of German nuclear power plants are obliged to perform a comprehensive quality management based on provisions for quality assurance specified in the Safety Criteria published by the Federal Ministry for the Environment, Nature Protection and Reactor Safety and in the nuclear safety standards of the Nuclear Safety Standard Commission (Kerntechnischer Ausschuss - KTA). The supervisory authority controls the result of the audits performed by the plant operator and the implementation of measures derived from it within the framework of on-site inspections. Ageing Management, i.e. measures for maintaining quality over a long period of time, is an integral part of the quality requirements. According to the Atomic Energy Act safety reviews (SR) have to be carried out at prescribed dates and are to be repeated every ten years. SRs are performed according to standardized national criteria and consist of a deterministic and a probabilistic part. SRs supplement the regulatory supervision and inspection of nuclear power plants. The results have to be submitted to the supervisory authority and are usually assessed by independent experts who act by order of the supervisory authority. The obligation to present the SR results is lifted if the licensee makes the binding declaration to the licensing and supervisory authority that he is definitively going to terminate power operation at the plant no later than 3 years after the final date for submission of the SR mentioned in the Atomic Energy Act. As the licenses for the operation of NPPs are not limited in time no renewal is required, notwithstanding the legal provisions for the phase-out of nuclear electricity production. For further information see . For further details on nuclear energy policy see chapter 1.2.3. All nuclear power plants currently in operation in Germany were constructed by Kraftwerk-Union (KWU, founded by Siemens and AEG) in the 1970s and 1980s. KWU, a 100% subsidiary of Siemens AG for a long time, was transferred to a French-German Joint Venture in 2001, in which the French AREVA has a shareholding of approximately two thirds and Siemens AG of one third. Since April 2006, the Joint Venture operates under the name of AREVA NP. The company Babcock-Brown Boveri Reaktor GmbH (BBR, a joint venture of Brown, Boveri & Cie. and Babcock&Wilcox from the USA, meanwhile ABB, respectively sold to BNFL/UK in December 1999, now renamed Westinghouse) supplied the PWR plant Mülheim-Kärlich, which was shut down in 1988. German utilities together with Siemens/KWU and in close co-operation with its French counterparts (EdF and Framatome) had been developing the European Pressurized Water Reactor EPR with enhanced safety features. The EPR is currently built in Finland and France. German utilities also supported the Siemens/KWU development of an advanced BWR (SWR 1000) with additional passive safety features. No exclusively German supplier of NPPs has remained with the start of the 21st century. In 2001, the remaining domestic manufacturer Siemens/KWU merged its nuclear business with Framatome SA, which in the meantime became part of the French AREVA Group as AREVA NP. The main activities are projects and engineering, nuclear services, nuclear fuel and mechanical equipment. Under the French management, the former KWU employees are engaged as well in the EPR activities in Finland and France. The second German supplier for NPPs, BBR, meanwhile part of Westinghouse, now concentrates on nuclear services. EnBW Kernkraft GmbH-EnKK as part of the holding company EnBW-Energie-Baden-Württemberg AG operates the four NPPs Neckarwestheim-1 and -2 and Philippsburg-1 and -2. The NPPs Brokdorf, Grafenrheinfeld, Grohnde, Isar-1 and -2 and Unterweser are operated by E.ON Kernkraft GmbH, which is a subsidiary company of E.ON Energie AG. The company RWE Power AG operates the NPPs Biblis A and B. The NPPs Grundremmingen B and C are operated by Kernkraftwerk Grundremmingen GmbH-KGG; the shareholders of this company are RWE Power AG (75%) and E.ON Kernkraft GmbH (25%). The NPP Emsland is operated by Kernkraftwerke Lippe-Ems GmbH-KLE which is held by RWE Power AG (87.5%) and E.ON Kernkraft GmbH (12.5%). Kernkraftwerk Brunsbüttel GmbH & Co. oHG-KKB holded by Vattenfall Europe Nuclear Energy GmbH (66.6%) and E.ON Kernkraft GmbH (33.3%) operates the NPP Brunsbüttel. Vattenfall Europe Nuclear Energy GmbH and E.ON Kernkraft GmbH are also shareholders in equal parts of Kernkraftwerk Krümmel GmbH & Co. oHG-KKK which operates the NPP Krümmel. The decommissioning licensee as mentioned in Table 11 is responsible for the decommissioning of the nuclear power plant. For decommissioning a license is required from the competent licensing authority of the Land in which the nuclear installation is sited. The licensing and supervisory process is described in chapter 3.1.1 and 3.1.2 of this report. All facilities necessary to close the nuclear fuel cycle have been realized or were projected in Germany. Today, only a few of them are in operation, several are shut down and being decommissioned or did not receive an operation license. In Germany search for mines containing uranium ore began very early. But only a few mines were of interest due to economic reasons and were operated as pilot mines. In 1961, West Germany erected a very small utility for yellow cake production at Ellweiler. The supervisory authority stopped work in 1989. The facility was decommissioned and restoration was finalized in 2000. In East Germany the large uranium production facility Wismut was erected, which in the beginning also supplied uranium to the Soviet Union. The facility is being decommissioned. At the enrichment plant at Gronau (URENCO Germany) natural uranium in the form of uranium hexafluoride is enriched via centrifuge cascades to a maximum of 6 percent by weight of fissionable U-235. The facility started operation in 1985 with a capacity of 400 kSWU/year. After the licensed capacity reached 1,800 kSWU/year, an expansion to a capacity of 4,500 kSWU/year was licensed in 2005. The expanded plant has been constructed since 2008 and will be commissioned gradually. At the end of 2009 the production capacity was 2,750 kSWU/year. At Lingen, the Fuel Element Fabrication Plant ANF (Advanced nuclear fuels GmbH) is in operation since 1979 and produces uranium fuel elements for light water reactors. In 2005, the increase of the throughput capacity up to 650 t of uranium per year was licensed. At the Siemens Fuel Element Fabrication Plant Hanau (Siemens Brennelementewerk Hanau, Siemens AG) mixed-oxide (MOX) fuel elements and uranium fuel elements for light water reactors were produced from 1968 until 1991 and from 1969 until 1995, respectively. The facility was decommissioned finally in 2006. The Siemens Fuel Element Fabrication Plant Karlstein (Siemens Brennelementewerk at Karlstein, Siemens AG) started in the year 1966 with the production of special fuel elements using low enriched uranium dioxide. Decommissioning of this plant was finalized in 1999. The company NUKEM produced at the NUKEM Fuel Element Fabrication Plant Hanau (Brennelementefabrik at Hanau) special fuel elements consisting of uranium and thorium for research reactors from 1962 until 1988. The decommissioning process is finalized (status: installation was removed, clearance of the site). The company Hochtemperatur-Brennelement-Gesellschaft-HOBEG operated a fuel fabrication for the production of spherical fuel elements composed of highly enriched uranium and thorium for high temperature reactors from 1972 until 1988 at Hanau. The utilitiy was finally decommissioned in 1995. Three central interim storage facilities for spent fuel are in operation: The Transport Cask Storage Facility Ahaus (TBL-A) for irradiated fuel, the Transport Cask Storage Facility Gorleben (TBL-G) for both, irradiated fuel and vitrified reprocessing products and the Transport Cask Storage Facility in the interim storage facility North Rubenow (Zwischenlager Nord -ZLN) for spent fuel elements, nuclear fuel, and other radioactive waste from decommissioning the NPPs Greifswald and Rheinsberg. In 2009 the Zwischenlager Nord was licensed to store vitrified waste from the shut down pilot reprocessing plant at Karlsruhe (WAK). In Germany the development of reprocessing technologies started in the 1960s. In 1989, the plans for reprocessing were abandoned and it was intended to transport irradiated fuel elements for interim storage and reprocessing into other member states of the European Union. These transports were outlawed in 2002 with the last transport allowed in 2005. At that time the direct final disposal of fuel elements became the aim of waste management. The pilot reprocessing plant at Karlsruhe (Wiederaufarbeitungsanlage Karlsruhe - WAK) operated from 1971 until 1990. The facility has been decommissioned and is in the process of being dismantled. The highly radioactive solutions of fissions products (HAWC – High Active Waste Concentrate) still present at this plant are vitrified at the on-site vitrification plant since September 2009. It is planned that vitrification will be performed until the end of 2010. Approximately 130 containers with vitrified waste will be produced and shipped to the interim storage facility Zwischenlager Nord. It is intended to dispose all types of radioactive waste in deep geological formations. The Federal Office for Radiation Protection (Bundesamt für Strahlenschutz - BfS) is responsible – inter alia - for the construction and operation of nuclear waste repositories. To fulfil its tasks the BfS may imploy the services of a third party. The BfS exercises this option. The third party in question is the Deutsche Gesellschaft zum Bau und Betrieb von Endlagern für Abfallstoffe mbH (DBE). Development work in this field started in West Germany with the Asse research mine - a salt dome in Lower Saxony -, where low- and medium-level radioactive waste was disposed from 1967 until 1978. After 1978 research and development on the safe disposal of radioactive waste was performed until 1992 in Asse without any further emplacement. In 2008, it was decided to change the license basis, ownership and operating organisation. Since the beginning of 2009, the BfS took over the responsibility for the Asse mine. Now a closure concept is in preparation. In the late 1960s, East Germany erected a repository at the former salt dome Morsleben, where low- and medium level waste was emplaced until 1998. Now, the licensing procedure for decommissioning is in progress. In 1979, the salt dome of Gorleben was assessed for its suitability as repository for all types of radioactive waste, in particular for high level waste. Exploration work started in 1985. In 2000, this work has been interrupted for a minimum of three and maximum of ten years (Gorleben moratorium). In October 2009, the government decided to continue the exploration of the Gorleben salt dome and the BfS is preparing to resume the exploration activities. The former iron ore Schacht Konrad was licensed as repository in May 2002 where all radioactive waste with negligible heat generation should be disposed. Finally in March 2006, all suits against this repository were rejected by court. Complaints against this decision were dismissed in April 2007. In May 2007, the Federal Office for Radiation Protection founded a working group, which is responsible to perform the planning for the conversion of the mine into a safe repository. Following necessary planning adjustments, the conversion work is ongoing. Safe operation of nuclear power plants has a top priority to the Federal Government as has consequently research in this field. In 2009, the Federal Government supported the field of nuclear safety research with a total of € 73.9 million, including nuclear waste. The research on the decommissioning of nuclear plants had an additional cost of € 134.4 million (€ 44 million hereof for repositories). Within the government the Federal Ministry of Economics and Technology (Bundesministerium für Wirtschaft und Technologie - BMWi) currently provides approximately € 20 millions annually for reactor safety research. Amongst others, experimental or analytical studies of the plant behaviour of light water reactors under accident conditions, studies concerning the safety of pressure retaining components and the development of probabilistic safety analysis are funded. Another € 10 million approximately are spent on repository and nuclear waste research. The Federal Ministry of Education and Research (Bundesministerium für Bildung und Forschung - BMBF) promotes projects and institutions with funds of around € 42 million, focussing on basic science issues regarding waste disposal, reactor-research and radiology. As a long term energy option the development of fusion reactors is currently supported by BMBF through research projects (€ 11 million) and institutional funding (€ 124 million). Two prototypes of advanced reactor design were developed in Germany: the pebble-bed high-temperature reactor (Thorium-Hochtemperaturreaktor, THTR 300) at HRB/BBC and a fast breeder reactor (Schneller Natriumgekühlter Reaktor, SNR 300) at Interatom/Siemens. After a successful commissioning and operation for some years, the THTR 300 was shut down. The SNR 300 was completed but never commissioned. As member state of the EU, OECD/NEA, and IAEA, Germany supports various international programmes in nuclear safety and nuclear waste management. In direct international co-operation Germany also supports projects and organizations, e.g. the licensing and supervisory authorities, technical support organizations and also research institutes. The provision of sufficient and qualified personnel is defined in the Radiation Protection Ordinance and the Atomic Energy Act. Proof of the qualification of the responsible personnel as well as the necessary knowledge of the personnel otherwise engaged during operation must already be included in the license application for construction, operation or essential modification. Detailed requirements for the technical qualification of the personnel are specified in guidelines. In addition, guidelines specify the qualification of responsible shift personnel and its maintenance as well as the qualification of personnel responsible for radiation protection. The measures of the operator to ensure adequate staffing are reviewed by the supervisory authority on the basis of reports submitted. German nuclear power plants currently in operation are staffed with personnel, which has a long experience in the operation of nuclear power plants and which is regularly retrained for their job at plant-specific full-scope simulators at the Simulatorzentrum in Essen. On average, about 350 own plant employees and about 150 employees of contractors are employed all year round per unit. During plant outage for refuelling and annual inspection, the number of external personnel is increased to 1000 employees approximately. Due to demographic personnel development, a forward-looking personnel management is implemented for maintenance of competence and the number of personnel. On the basis of expected retirements, as well as statistical forecasts, the plant operators typically plan the need of replacement recruitment up to five years in advance. Systematic training programmes and a long-running “parallel recruitment” are performed to ensure the know-how transfer. Since 2000 a monitoring group of representatives of government and nuclear power plant operators meets on a regular basis to discuss current issues around the development of nuclear power in Germany. Germany is organized as a federal republic. The responsibilities for legislation and law enforcement are assigned to the organs of the Federation and the Länder according to their scope of function. Unless otherwise specified, the execution of federal laws lies within the responsibility of the federal states, the 16 Länder. According to the Basic Law (Grundgesetz) the Federal Government has the legislative competence for the peaceful use of nuclear energy. The Basic Law also states that the Atomic Energy Act is executed - with some exceptions - by the Länder on behalf of the Federal Government. In this respect, the Länder authorities are under the oversight of the Federation with regard to legality and expediency of their actions. In the hierarchy of legislation, international treaties concluded by the Federal Republic of Germany are on the same level as formal federal law. In addition, legislation and its execution must take into account any binding requirement from regulations of the European Union. There are, e.g., the EURATOM Basic Safety Standards for the protection of the health of workers and the general public against the dangers arising from ionizing radiation. These were issued on the basis of the EURATOM Treaty. In accordance with the EURATOM Treaty any use of ores, source material and special fissile material is subject to the Safeguards of the European Atomic Energy Community. The IAEA Safety Standards are not implemented into national regulations, but national regulations are comparable and much more detailed. As Germany is organized as a federal state, the execution of federal laws lies in principle within the sole responsibility of the federal states, the Länder, unless otherwise specified. The "Regulatory body" is therefore composed of Federal Government and Länder government (see Figure 3 and Table 12). By organisational decree, the Federal Government specifies the Federal Ministry for the Environment, Nature Conservation and Nuclear Safety (Bundesministerium für Umwelt, Naturschutz und Reaktorsicherheit - BMU) as the supreme regulatory authority in charge of nuclear safety and radiation protection. The BMU is responsible for the federal supervision of the lawfulness and the expediency of the actions of the Länder including the right to issue binding directives. The subordinate authority to the BMU is the Federal Office for Radiation Protection (Bundesamt für Strahlenschutz - BfS), which supports the BMU technically and scientifically, especially in the execution of federal supervision, the preparation of legal and administrative procedures, and in intergovernmental co-operation. According to the Atomic Energy Act the respective Länder governments determine the supreme Länder authorities in charge of the licensing and supervision of nuclear power plants (see Table 7). For technical matters in the licensing procedure and the supervision of nuclear facilities, the regulatory authorities of the Länder are supported by independent technical support organizations, in general the nuclear departments of the technical support organizations (e.g. TÜV). (	This also means that the Federal Government may execute its power to decide the respective matter in hand itself and initiate on its own authority the corresponding detailed examinations. A license is required for construction, operation, essential modifying such installation or its operation and decommissioning of a stationary installation for the production, treatment, processing or fission of nuclear fuel. Pursuant to the Atomic Energy Act, licenses for the construction of nuclear power plants for the commercial production of electricity are no longer issued. The operating licenses for the existing nuclear power plants are not limited in time and thus do not require a renewal. The authorisation for power operation of the existing nuclear power plants expires once the electricity volume for the respective plant as stipulated in the Atomic Energy Act or the electricity volume derived from transfers has been produced. Therefore, licensing procedures are only performed for the modification of existing nuclear installations and for decommissioning. The actual details and procedure of licensing are specified in the Nuclear Licensing Procedure Ordinance. Here the application procedure, the submission of supporting documents and the participation of the general public are described. Furthermore the Nuclear Licensing Procedure Ordinance specifies the assessment of any environmental impact and the consideration of other licensing requirements (e.g. regarding the possible release or discharge of non-radioactive pollutants into air or water). The written license application is submitted to the competent licensing authority of the Land in which the nuclear installation is sited. On the basis of the submitted documents, the licensing authority examines whether or not the licensing prerequisites have been met. All federal, Länder, local and other regional authorities whose jurisdiction is involved shall take part in the licensing procedure. These are e.g. authorities responsible under the building code, the water code, for regional planning and for disaster control. Participation of the public was obligatory for construction licenses. In case of major modifications, the authority may waive a public participation if the modification does not give rise to the concern that there might be adverse effects on the public. However, the public has to be involved if this is required pursuant to the Act on the Assessment of Environmental Impacts. The competent authority performs a final evaluation of the environmental impacts on the basis of the requirements in nuclear and radiation protection regulations. The final decision of the licensing authority is based on the entirety of application documents, evaluation reports by the authorized experts and, if available, the statement by the BMU and the authorities involved as well as the findings from objections raised in the public hearing. As in licensing, the prime objective of the regulatory supervision of nuclear installations is to protect the general public and workers in these installations against the hazards connected with the operation of the installation. Nuclear installations are subject to continuous regulatory supervision over their entire lifetime - from the start of construction to the end of decommissioning. Supervision is performed by the Länder authorities on behalf of the Federal Government. Authorized experts called in by the supervisory authority have access to the nuclear installation at any time and are authorized to perform the necessary examinations and to demand pertinent information. In addition, the operators of NPPs have to supply operating reports to the supervisory authorities at regular intervals. Any events that are relevant to safety and to physical protection must be reported to the authorities. In addition to the continuous regulatory supervision, comprehensive periodic safety reviews are to be performed every ten years. Pursuant to the Atomic Energy Act, the Nuclear Financial Security Ordinance regulates that sufficient financial security for covering possible claims for damage compensation is provided. The Paris Convention on Third Party Liability in the Field of Nuclear Energy, amended by the Brussels Supplementary Convention is taken into account. For damages due to a nuclear event caused by a nuclear installation, the operator generally has unlimited liability. In order to fulfil the obligation to pay any damages, the operator has to provide financial security which may amount to € 2.5 billions. This financial security may be ensured by liability insurance or other financial means, e.g. private warranty. The Federal Government and the Land issuing the license jointly carry an additional indemnity of up to € 2.5 billions which may be claimed by the damaged party. The individual power utilities or their subsidiaries are the licensees of the NPPs. They are obliged by law to build up financial reserves to be prepared for the follow-up costs connected with the operation of a nuclear power plant such as the decommissioning and dismantling of the installations, and the treatment and disposal of radioactive material including spent fuel. So far, reserves amounting to 35 000 million Euro have been set aside, of which about 45% are earmarked for decommissioning and dismantling and about 55% for waste management. The responsibility for the disposal of radioactive waste lies with the Federation, the BfS is the legally responsible authority. All other radioactive waste management facilities, i.e. spent fuel interim storage, are within the responsibility of the waste producers. The Länder have to construct and operate regional state collecting facilities for the interim storage of radioactive waste originating, in particular, from radioactive applications in medicine, industry, or universities. The protection objective of disposal of radioactive waste in a repository is laid down in the Atomic Energy Act and the Radiation Protection Ordinance. The Federal Mining Act regulates the aspects concerning the operation of a disposal mine. The Safety Criteria for the Disposal of Radioactive Waste in a Mine specify the measures to be taken in order to achieve that this objective has been reached. Presently these Safety Criteria are on review. In addition, environmental legislation must be taken into account; in particular an environmental impact assessment has to be performed. For further information see  and . The Atomic Energy Act is the core of national regulations with respect to nuclear safety and waste management in Germany. It was promulgated on 23 December 1959. Since then, it has been amended several times. After the amendment of 2002 the purpose of the Atomic Energy Act is to end the use of nuclear energy for the commercial production of electricity in a structured manner and to ensure on-going operation up until the date of discontinuation, as well as to protect life, health and property against the hazards of nuclear energy and the detrimental effects of ionizing radiation and, furthermore, to provide for the compensation for any damage and injuries incurred. Most of the regulations laid down in the Atomic Energy Act are not exhaustive and are further specified both regarding the procedures and the substantive legal requirements by ordinances, general administrative provisions and regulatory guidance instruments. Especially the safety standards of the Nuclear Safety Standards Commission (Kerntechnischer Ausschuss - KTA), recommendations from the Reactor Safety Commission (Reaktor-Sicherheitskommission - RSK), the Nuclear Waste Management Commission (Entsorgungskommission – ESK) and the Commission on Radiological Protection (Strahlenschutzkommission - SSK) but also conventional technical standards (DIN, ISO and IEC) comprise concrete rules concerning the safety of nuclear power plants. For further information see Bilateral Agreements in chapter 1D of the Handbook on Nuclear Safety and Radiation Protection.